Kings, Heroes, Mountains? : Who will stand where Lenin stood? Will a Biblical figure replace the Godfather of Socialism in the capital of Armenia? Will Noah stand where Lenin stood in Republic Square? Now that the reconstruction of Armenia's main square has been completed, the question is again being debated as to whose statue will be placed as a centerpiece in the spot between the main post office and Armenia Hotel. The Municipality of Yerevan has opened a competition October 29 to take ideas that might answer the question, but so far only two suggestions have been put forth. The competition is to close on December 15. Ever since the statue of Vladimir I. Lenin was taken down in 1991, various competitions have been held to come up with a suitable replacement. The city's department of architecture has received plenty ideas over the years, but none of them deemed suitable. Some have wanted to see a statue of Mt. Ararat with Noah's Ark on it and a big clock (never mind that there's already one atop the government building). 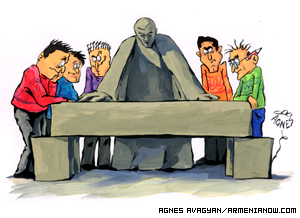 Others want to see a statue of Tigran the Great or maybe all the kings of Armenia. Some have suggested moving David of Sasun from his home at the railway station. "Previous competitions produced no result," says president of the Union of Architects Mkrtich Minasyan. "This time it is an open competition as a result of which we will try to collect better ideas." Minasyan says the majority of offers and ideas suggested during previous competitions were odd or absurd. Still, according to rules of the competition, all suggestions will be publicly discussed. Even though only two ideas have been presented during this competition, Minasyan says there have been many phone calls and he expects the number of participants to increase sharply before the competition closes. "I don't know why but everybody is concerned with this problem and it seems that everyone is striving for placing something here insisting that his or her idea is the best," says Minasyan. "This is a very important place and placing something absurd there would have a negative effect on the beautiful ensemble of the Square." Since the bronze Lenin came down, many residents have speculated on what or who ought to replace him. Sixty-year old Yerevan resident Maxim Hambardzumyan was against removing the statue of Lenin, believing that the statue was an architectural masterpiece. "Nobody deserves to stand here," he says, looking at the empty place. "Lenin wasn't virtuous, but it should not have been removed as it was a valuable statue. His statue was removed as they wanted to take revenge on him. If it is like that then, ok, let others be placed there but one day their statues will also be removed." Tamanyan junior says today it's much easier to place a statue than to construct a building useful to people. 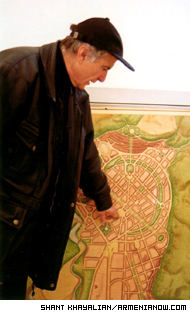 Specialists assure that when architect Alexander Tamanyan was drawing a plan of the Square in the beginning of the previous century he left this place empty, opening a beautiful view to Shahumyan Park and Armenian mountains. "Soviet authorities made a decision to place a statue of Lenin on that spot and architects brilliantly solved that task without spoiling the general theme of the Square," says president of the Union of Architects. "But today's government doesn't know what to place here and tells us, as specialists, to solve this problem." Minasyan assures that architects can suggest a good idea only in case of an order. "This is also a political place and Botero's cat or some other valuable creation cannot be placed here. This question must be solved on the government level," he says. Tamanyan's grandson, 61 year old Alexander Tamanyan remembers that his father Gevorg, who was also one of the prominent architects of the city, used to offer just to plant grass on that territory increasing the green zone of the square. "It is simply easier today to place a statue rather than to construct a building useful for the society and show people that there is a progress in the city," says Tamanyan junior. Thanks to historical events, the green dream of the elder Tamanyans has come true for now. However nobody can guarantee that tomorrow it won't be replaced by another dream, when Noah with his family will land in his Ark on Republic Square.